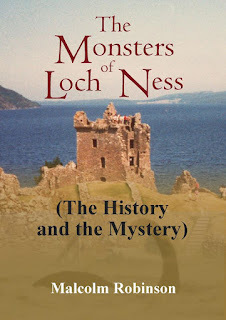 A Review of "The Monsters of Loch Ness"
The month of August saw the publication of Malcolm Robinson's "The Monsters of Loch Ness" and I have only just finished reading this rather prodigious work. Being a Scotsman, like myself, and one interested in mysteries, Malcolm has long had a fascination with the Loch Ness Monster and this year he finally got round to writing the book he had always wanted to write. At 581 pages long, it is certainly the biggest book on the mystery, though I suspect in terms of word count, Roy Mackal's similarly titled 401 page book still holds sway due to its smaller font and more densely packed text. However, publishing a book on Nessie isn't about beating records, it's about adding to the reader's experience of the whole phenomenon. 1. It adds to the storehouse of data such as new sightings, films, sonar, photos, etc. 2. It adds to the speculation or theorising about the subject. 3. It adds to the human side of the story (culture, folklore, biographies). 4. It may not add to the above but it present the story in an entertaining and engaging way. I would certainly say that Malcolm's book adds in three of the four areas. For a start, the book is a partly an autobiographical affair as Malcolm recounts his various trips to Loch Ness (and Morar) since the 1960s when he first went as a boy with his family. Indeed, he thinks he may have had his own sighting, but leaves readers to form their own opinion (as he does on various aspects of the mystery in his book). Malcolm is the founder of Strange Phenomena Investigations (SPI), which has been running since 1979, and includes the strange phenomena at Loch Ness and Loch Morar in its provenance. You can read about these trips in his book, and be prepared for some "left of field" investigations as Malcolm probes the more paranormal depths of these waters. That does not imply that Malcolm is about to plunge us into the world of paracryptozoology, rather he attempts to present the subject in an even handed manner across a variety of thoughts, accounts and interviews. But there is one thing Malcolm has to be thanked for and that is bringing the history of the mystery right up to date. 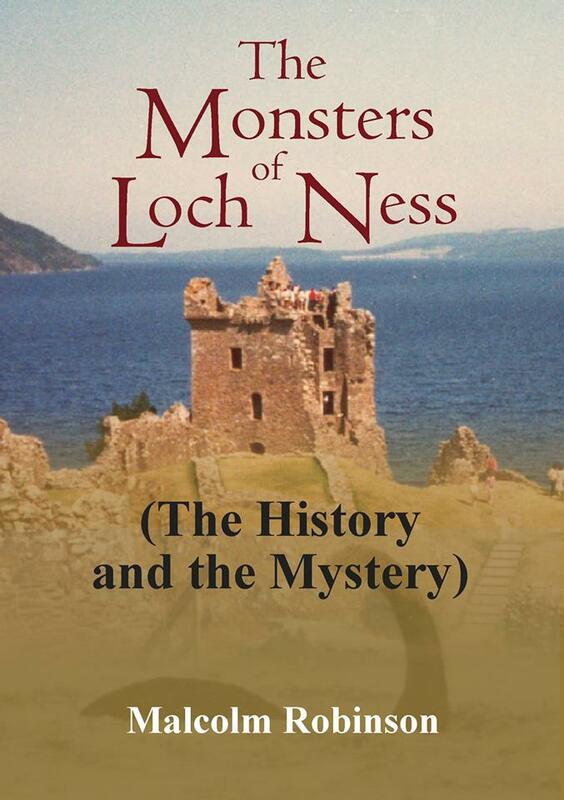 Recent publications on the beast and its pursuers have done a good job in informing the debate, but for me there was still a void between the present day and Witchell's history written in "The Loch Ness Story" thirty years ago. In other words, what exactly has been going on at Loch Ness since the late 1980s to the present day? One or two sceptically oriented books have filled some of the gaps, but they don't present the monster side (because they don't accept there is a monster). Malcolm's book has now largely fulfilled this task. Of course, one may say "So what? We now have the Internet. ", but that is a fragile statement. As my own list of defunct Nessie websites shows, nothing is guaranteed permanence on the World Wide Web. One day, this website will disappear and all the others and there is no guarantee that their data (pro- or anti- Nessie) will survive. I would also note that even if the information is out there on the Web, its diffuseness may not guarantee you have everything you need to know. Even the cryptid news items on established major media websites will eventually get deleted. We do have web archiving projects, such as the WayBackMachine, but it won't have everything and paywall newspaper archives have not digitised the more recent years as newspapers from the 19th century and so on draw a larger audience of historians and genealogists. In other words, there is still a place in the modern world for the paper book and its ability to collate and condense information into the hands of readers, no matter what the state of the Internet is. To that end, Malcolm's store of newspaper clippings from the 1970s to the 1990s is a valuable resource. In the weird world of Nessie, Malcolm reveals the weird world of people who inhabit it. Have you ever heard of Lambert Wilson? Or the story of the local who claims there is a UFO base beside the loch? Add to that Malcolm's own ideas on how to catch the monster (as endorsed by Steven Spielberg) allied with his trip in a submarine down into the depths of Loch Ness, and you begin to get an idea of the rich tapestry being woven. That leaves us with the monster itself. Malcolm begins with the old Kelpie legends as well as spreading his net to other lake monsters in Scotland and beyond. Going over Malcolm's collation of stories, I realised there were some eyewitness reports which were worthy of further follow up by myself. Indeed, one claimed photograph of Nessie appears to yield nothing on a Google search, which just goes to prove my above points. Of course, Malcolm goes through many reports which are the bread and butter of Loch Ness Monster research, and we would not expect these to be edited out because of the familiarity seasoned researchers may have with them. In fact, I can help him out with some of them! For example, on page 115, Malcolm wonders what became of a photograph taken by a Morayshire couple in 1934. Wonder no more, Malky, and go to this link! One thing I did not agree with Malcolm on is the vexed subject of land sightings. He has his doubts about them and is wary of such tales. On the other hand, I do accept them as a viable part of the Nessie database, but who said Nessie believers had to agree on everything? It is the sceptics who all march in monotonous time to the same beat and theory. Malcolm's problem with this is the issue that the creature seems to be a water-breather which seems at odds with lumbering about on land. As I said, Malcolm covers some photos and videos from the 80s and 90s which are worth following up again in this Internet age, so watch this space. Malcolm ends his book by covering the beliefs of various people from mind-bending paranormal manifestations to boring old waves and logs. He rates each "monster" theory and then muses himself at the very end. Don't expect new revelations on this matter. After all, we've had 82 years of speculation and most of the theories were suggested within the first two years! All in all, I enjoyed my trip through the Loch Ness of the past with Malcolm. His style of writing is certainly of a folksy, conversational genre which makes you feel that he is talking personally to you rather the usual delivery of modern books. Some may find that irritating, I was okay with it and found it amusing in parts. Others have complained, with some justification, regarding the spelling and grammar of the text. Yes, there were spelling mistakes and I jokingly wondered whether Malcolm believed in Nessie more than he did in commas and semi-colons! I did have to double take on a few sentences, but once I got into the book, that particular problem went away. There were other mistakes, such as placing Lake Champlain in Canada and a couple of instances where the same story was repeated in a short space. Well, actually, a small part of Lake Champlain does cross into Canada, so I guess it is partly correct! I was hoping that Malcolm would have addressed the issue of Dr. James Lee from Hastings who took the "F. C. Adams" monster picture from 1934. Hastings has been Malcolm's stomping ground for some years and I wondered if his local connections may dig up something. Perhaps another day. So, I give the book four stars out of five and thank Malcolm for his effort into putting this together. As a fellow Scot, I am glad to see someone from north of the border putting some expertise into the subject. As Malcolm well knows, we have too many Sassenachs crowding the Nessie arena! You may think the above 3D contour map of Loch Ness was derived from some modern sonar study or similar. However, the data points used to generate the image were from the 1903-04 bathymetric survey of the loch conducted by Murray and Pullar. The total number of soundings was 1700 and those have been fed into the plotting software which you can examine at this link. Similar maps for Loch Morar (below), Lomond and Leven can be viewed as well as the 2D representations.